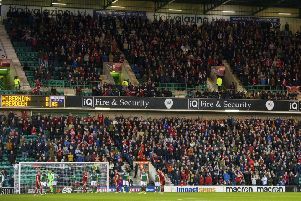 Hibs chief executive Leeann Dempster has revealed that Hibs are planning to spend more than £100,000 on a state-of-the art CCTV system in a bid to combat the blight of anti-social behaviour at football. 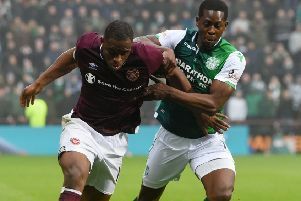 The Easter Road club has been involved in several high-profile incidents this season, with one supporter entering the field of play to confront Rangers captain James Tavernier last month. That occurred less than a week after a Buckfast bottle had been thrown in the direction of Celtic’s Scott Sinclair. Police Scotland interviewed 37 witnesses but have been unable to identify the perpetrator of that act, which was not caught on film due to cameras being momentarily trained on a different area of the ground. While the previous surveillance system was considered one of the best in the country outwith Celtic and Rangers, Dempster has signed off on an upgrade that will supersede anything else in use in the SPFL. The new set-up will see 11 high definition cameras installed this summer that will cover every area of the stadium and ensure no blind spots, with one member of Hibs’ hierarchy revealing “it can read a tattoo”. “While we already have an excellent system, every CCTV system has its limitations,” Dempster said. “It’s important that, where we think technology can be improved and help us, we utilise that. Dempster also hopes to work with Police Scotland to utilise sniffer dogs, which could help to prevent supporters entering the stadium with drugs and certain types of pyrotechnics. And she plans to introduce an anonymous text lines so fans can report bad behaviour.